Painting with watercolors, in the moment and on-site, is essential to my work. My watercolors are a visual diary of the cityscapes, street views, intimate vistas and cozy interiors that I frequent. Though the subjects vary, they all have the connection that is found in stonework, flowers, rooflines, windows, cafe tables. I may seek out a local urban setting, such as a garden in Greenwich Village, or a twisting cobblestone street in a small town in Tuscany because I find that more exciting than iconic landmarks. When painting outdoors, I become immersed in the life of the location itself. Honking cars, the sun and wind on my face, snippets of conversation—all become woven into my work. Plein air watercolor painting is distinguished by the challenge to capture the light and essence of a location within a few hours of time. Traveling with an efficient, portable studio makes that an easier goal. I rely on keen observational skills and jump directly into paint on paper without any preliminary sketching of the subject. Loose and fluid brushstrokes are natural and gestural this way. I visualize buildings and architectural details with a creative freedom to forego perfect angles and edges. Contemporary landscape artists including Wolf Kahn, David Hockney and Lois Dodd inspire me to approach painting in this expressive, intuitive manner. My parents were passionate collectors of art from around the world, and surrounded me with a treasure-trove of rich hues and textures that continue to influence my work today. While watercolor is the primary focus of my art, I use many other techniques that allow me to explore the color, rhythms and patterns that I love. I create monotype prints with Chine-collé to play with repeated motifs in an abstract manner. Pastels and pen-and-ink drawings, often fashioned into hand-bound sketchbooks, become personal ways that I picture my observed world. I want people to see my artwork and have the same emotional response that I have had creating it. I hope that my work suggests places and memories that are both beautiful and meaningful.—Susan Greenstein, October, 2018. 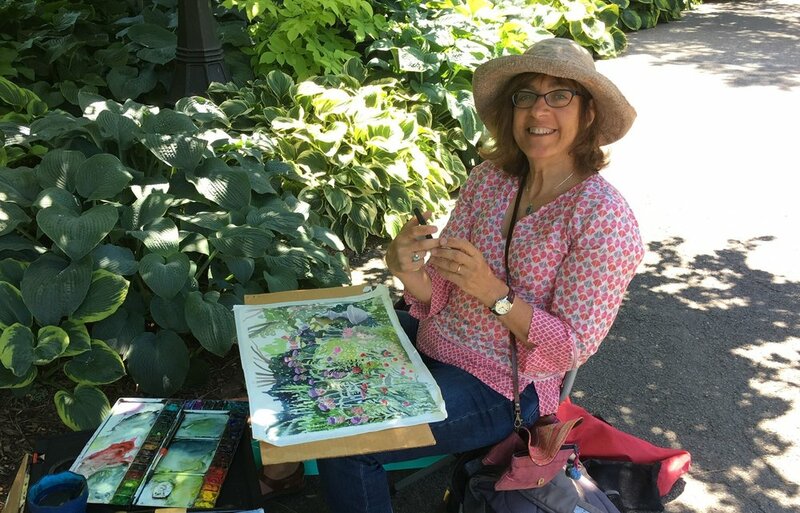 Susan Greenstein is a graduate of Pratt Institute and Queens College, and has attended programs at Art New England, Bennington College and Maine College of Art’s Feed Your Soul. Her work can be found in private collections across the US, and she has exhibited extensively in New York City, New Hampshire and Delaware Fine Arts Museum. She is a member-artist of 440 Gallery in Brooklyn, NY, and directs the Young Artist program at the gallery. As an art educator, Susan has influenced and mentored many young artists at Brooklyn Friends School and Studio in a School. She lives and works in Brooklyn, NY.